Monarch Air Group provides private air charter in Harrisburg, PA. Our clients benefit from top-notch service, unrelenting dedication to safety, wide selection of aircraft, and years of experience in chartering private jets. To obtain a free quote, please use our online quoting tool provided below, or call toll free 1-877-281-3051. Monarch Air Group provides private jet charter flights in and out of Harrisburg, Pennsylvania, USA. 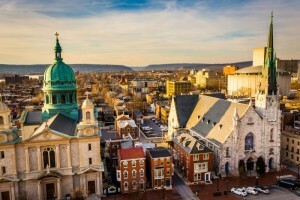 Located on the east bank of the Susquehanna River, Harrisburg is the capital of Pennsylvania. It is the governmental, financial, cultural, entertainment, and recreational center of South Central Pennsylvania. With its diverse and rich history, a scenic, riverside city of Harrisburg offers unforgettable and enjoyable experience to its tourists. The most notable attractions are the National Civil War Museum, the State Capitol Building, the Susquehanna Art Museum, the Pennsylvania National Fire Museum, the Pennsylvania State Museum, the Fort Hunter Mansion and Park, the Whitaker Center for Science and the Arts, the Theaters Harrisburg, and Benjamin Olewine Nature Center. The city has a 1200-acre greenbelt, 200 community events, 27 parks, the great Riverfront Park that hosts an AA baseball team, the Harrisburg Symphony Barge Concerts and the Senators. Annually about 100 family-friendly and award-winning festivals like the Multicultural Festival and the Harrisburg Jazz are held in Harrisburg.